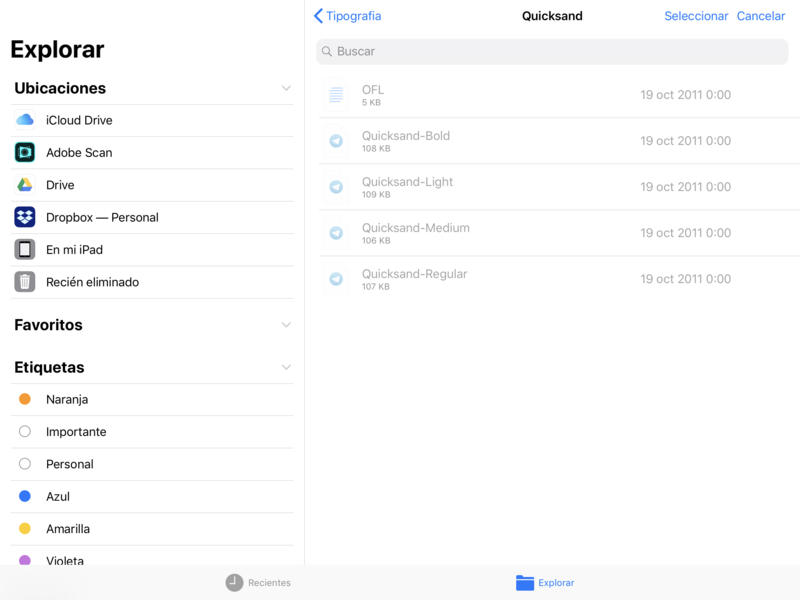 I just purchased Designer for my iPad Air 2. I‘ve noticed that none of the delivered fonts have any of the advanced features. All have Capitals and a few also have Figure Positions, but nothing else. Do these features have to be turned on somewhere? Thanks. 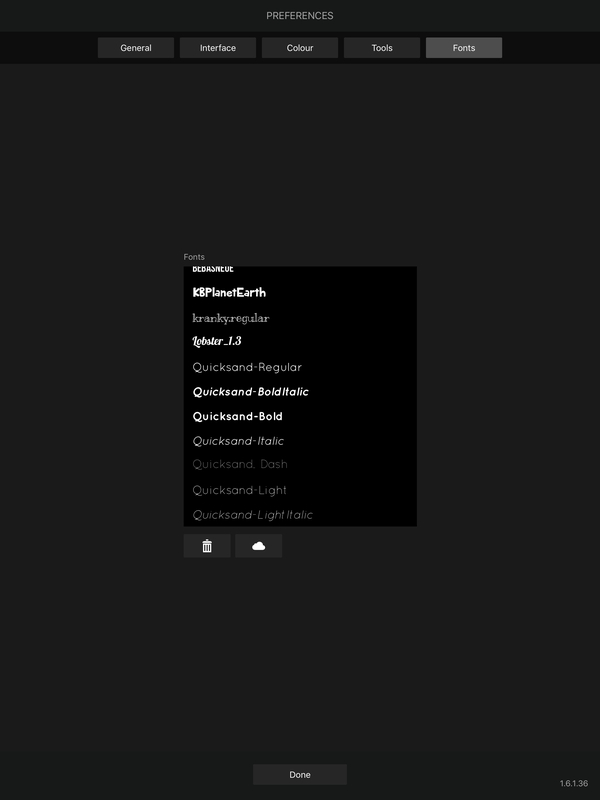 These features don't need to be turned on, it's simply that many fonts included on iOS don't support these features. You can install custom fonts through the settings of Affinity Designer, so if you have any specific fonts or typography features in mind this can be easily achieved, check out our video below! Thanks for your reply. I had seen the video and it’s great that this feature is available, but I’m a bit disappointed that none of the included fonts can utilize the advanced typography feature. I would have thought that “Zapfino”, for instance, would have been a prime candidate. I guess I’ll have to search for custom fonts. I could easily be wrong but I have the impression that the fonts with lots of these advanced features are usually quite pricey & designed for specialized uses in niche markets. I’m not so sure about the “niche markets” aspect, but I think you’re right about the “usually quite pricey”. For example, the font used in the ‘Advanced Typography’ tutorial video costs about US$35, and that’s just for a single weight. However, there are many free fonts with various OpenType features (sometimes with more than just two or three) if you know where to look. However, there are many free fonts with various OpenType features (sometimes with more than just two or three) if you know where to look. OK, are you going to tell us where to look or keep that a secret? 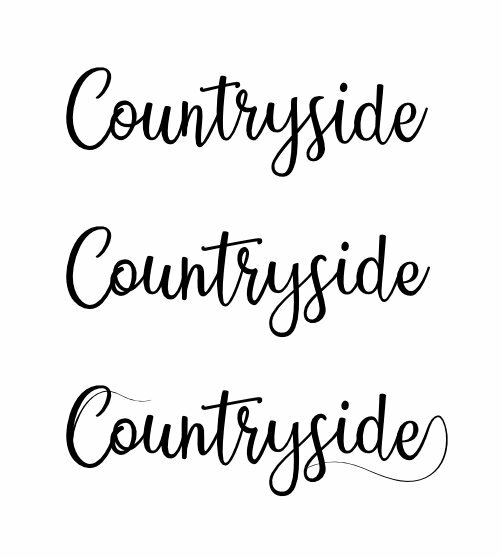 Regarding the fonts you show samples of, Countryside is free for personal use only, with a commercial use licenses priced "From $39.00." Talapanna is also described as free for personal use, but I could not find any info about commercial use restrictions. Are you going to tell us? You’ve obviously managed to find out! Joking aside, Font Library is a good source of free fonts, but I don’t know of a way to find out about the extent of OpenType support without downloading the font(s) in question. I’d forgotten about the “free for personal use” aspect as it relates to Countryside and other Billy Argel fonts. 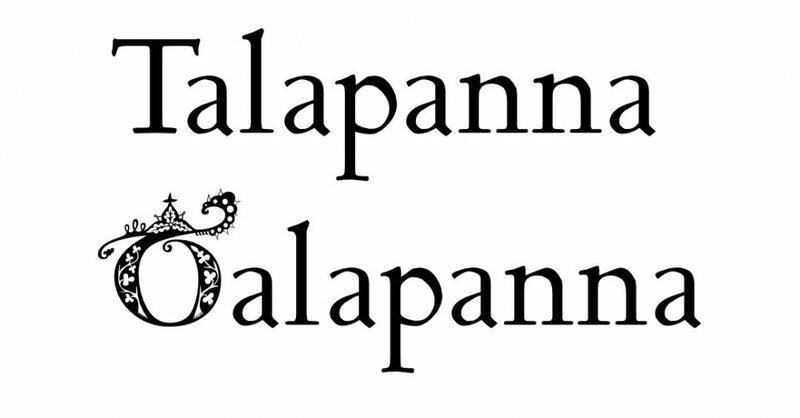 Talapanna, like all of Bhikkhu Pesala’s fonts, is completely free (and you can even distribute modified copies, as long as you comply with the terms of the GNU licence under which it was released). Are you going to tell us? You’ve obviously managed to find out! I only found out about the one Apple font, & I did that by tedious trial & error. All I meant was that you found Countryside and Talapanna by yourself. Sorry about that! The font manager that I use allows me to search its database for fonts with particular OpenType features, but it’s currently only available for Windows (and again, you can’t get that information into the database unless you have a copy of the font). All I meant was that you found Countryside and Talapanna by yourself. Actually, all I did was look at your post & start searching for fonts with those names, & it took me a while to figure out that Olapanna was not a font! You can sign up to various font vendor's website newsletters and each week receive information on both free and paid-for fonts. Many/most of the free fonts have OT features and also includes a commercial license. Could you confirm for me, are you trying to install the fonts from your local iPad storage or the cloud? As you can see from Liliana’s screenshot, the Quicksand font family is released under the (SIL) OFL, or Open Font License, so it’s freely distributable. 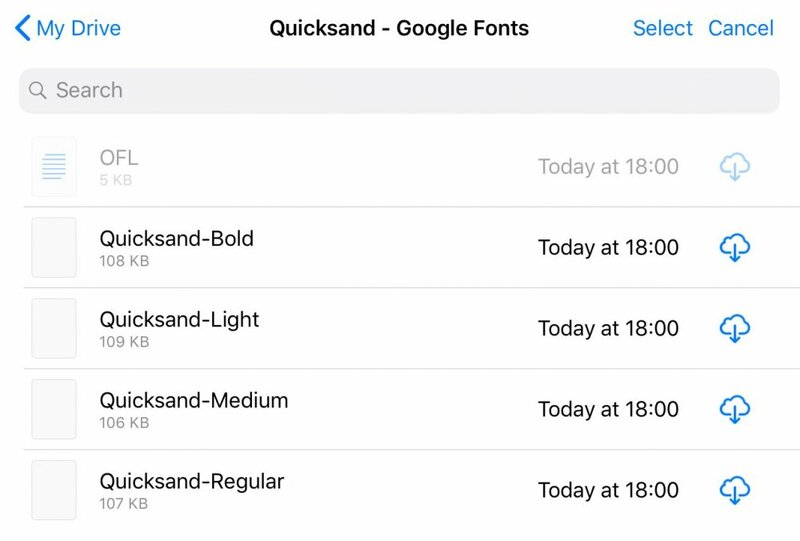 Edit: Since that font is distributed by Font Squirrel, the easiest way to install it on iPad is to use the ‘Install on iPad’ button on their Quicksand page. More coffee needed for me! Are your fonts still in a ZIP folder? These will need extracting before Affinity can access the fonts. I’ve successfully installed the Google Fonts version of the Quicksand family (four styles, unlike the seven from Font Squirrel) via Google Drive. When I browsed to the folder containing the fonts, I didn’t see ‘paper aeroplane’ icons, which suggests to me that there may be some kind of file association thing getting in the way. Thanks for confirming that, I have the same issue on the iPad here and each font has been assigned an icon for a different app than yours, in both Files and Designer. If I open my Google Drive in the Files app, I can't select these font files either and they are greyed out, which would lead me to believe this is a file association issue as Alfreds post above shows the fonts without icons and he is able to install them in Designer. I had tried with the cloud and the same thing happened... now tried with dropbox and it worked!!! Thanks so much everyone:) Have a good one! That would explain it, Dan! I uploaded those font files from my iPad.